This beautiful boy showed up at our back door in Nova Scotia in 2000. He never left. We suspect he was the kitten of one of the cats abandoned by our neighbours after they moved away. For a while, Julius was being fed by another family as well. duping them into thinking he had no home. He was the smartest cat we've ever had. Julius was a beautiful boy who will always be in our hearts. He lived in four provinces and crossed Canada twice in our car, and never complained once about his journeys. We lost Julius on November 16, 2015 to kidney failure, when he was about 16 years old. We love you, Julius. 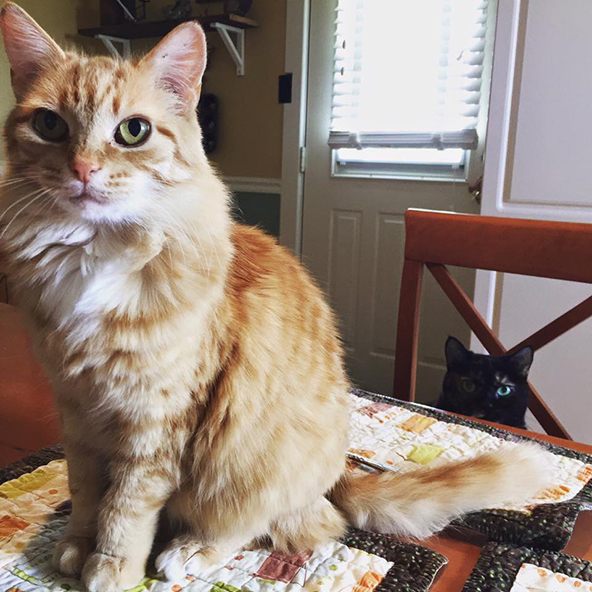 We adopted Mootie along with her friend Pip in October 2014 (see Pip's story!) Mootie had a difficult life. At one point she languished in an animal shelter for year, labelled "unadoptable," until her kind former owner took a chance on her. It turned out that Mootie did not want to be touched because she was in pain from a mouthful of bad teeth and diseased gums. The woman who adopted her (and Pip) took Mootie to the vet, where she had all her teeth removed. Cue complete change in personality! In 2015, we took Mootie to the vet for a hernia repair, where it was discovered that all the internal stitches from her spay (done years back) had failed at some point. So the contents of her abdomen were essentially being held in by her skin! Our vet repaired that and Mootie healed up perfectly. Mootie adored attention and was a pest about cuddles. She constantly demanded to sit in your lap, and lovednothing more than to walk across your chest to block the book you were trying to read in bed. She was the happiest cat in the world, and like Louise, drooled to express her gratitude for being cuddled. She would also unapologetically knead your flesh with her pointy little claws. Mootie was born sometime in September 2006. We lost her to cancer of the larynx on July 23, 2018. This special cat will not be forgotten. RIP darling Mootie. In September 2014, we adopted Lionel along with his friend Missy, from friends who thought their barn was inadequate shelter for the cats in winter. Sadly, Lionel was only with us for 13 brief days before he succumbed to toxoplasmosis on October 5th, 2014, despite valiant attempts by our vet to save him. He will never be forgotten. A wonderful, sensitive, affectionate cat with a beautiful chirpy purr. Our "Vizsladorable" born in 2002. He was a Lab/Vizsla cross who came to the farm with his buddy Sophie in 2007. We adopted the pair of them after a tragic incident in the family meant their owners could no longer keep them. We sent Tristan off to be with his buddy Sophie on October 4, 2016 at the ripe old age of 14, but he will always be part of the farm. He and Sophie are now buried in our woodlot, where they had countless happy walks. Back in the day, Tristan was an expert at being skunked. In one record-breaking summer, he was sprayed at least seven times. On March 23, 2017, we welcomed Ninja and his sister Cindy to the goat herd. They were a lovely pair of Pygmy-Nubian crosses born in 2014. Sadly, we lost Ninja unexpectedly a few months later. He was quite protective of his sister, friendly and sweet. One afternoon, we found Ninja lying on his side in the goat house. He left us for pastures on the other side. He was a good goat and is very missed. We adopted Sophie along with her buddy Tristan in November 2007, after their owner died in tragic circumstances. She was a wonderful 99% Labrador Retriever with a keen mind and a beautiful personality. She was born on a farm and lived on a farm until the day she died, as it should be. Every morning, including the last day of her life, Sophie waited patiently for Natalie to give her the crust from her toast. She had extraordinarily gorgeous blonde eyelashes fringing her big brown eyes. How could you say "NO!" to such a face? Our dear Sophie left us in April 2014 after being diagnosed with hemangiosarcoma in her liver. She was already bleeding out from the ruptured tumour when we took her to the vet, where we said our good-byes. Sophie was a huge part of our life for almost seven years. We think she's still keeping an eye on us all from somewhere out there. The farm is not the same without her. We adopted Lenny through the OSPCA in December 2014. He was a blind, 27-year-old(!) farm mallard, previously owned by an elderly farmer and his wife who had to give him up due to illness in the family. We were told that Lenny liked a banana in the morning, layer mash in the day, and some lettuce at bedtime. We did our best to oblige him. Lenny left this world peacefully in September 2015. We wish he'd had more time with us, but he had a very long and happy ducky life. On top of that, Penny was pregnant with triplets when she arrived, and after she gave birth in January, she became quite ill with diarrhea and anemia. But she was a real fighter, and bounced back to raise three of the most adorable goat kids you can imagine. They were partially bottle-fed because Penny didn't have enough milk to sustain them. We kept a close eye on Penny, who had a peaceful, gentle nature, and weathered her misfortunes with caprine grace. She was named after our wonderful human friend Penny. Sadly, Penny was in poor health through most of 2017, and on August 29th, we made the decision to euthanize her to spare her further suffering. She was a goat to remember! Keaton, aka Catman, was born sometime in 2013. He showed up at our farm in July 2015, looking hungry and wary. I started putting food out for him, but it took a long time before he would even let us stick around while he ate. The rule around here is that kitties who show up get to stay, but no one gets to keep his nuts! So we live-trapped this boy and had him fixed and vaccinated. He became super affectionate and friendly and was an excellent barn cat, so very chatty with a deep, funny meow. He also purred more, and more loudly, than any cat we've ever known. His purr was musical and sounds a bit like a babbling brook. He was big boy with a big heart, and he loved to be loved. He gave the best hugs. He also learned to be polite with the other cats instead of slapping them out of his way as he charges the food bowl. Keaton broke our hearts when he died on October 2, 2018 at the far-too-young age of five. He has a huge tumour wrapped around his kidney, and there was nothing to be done. He was the meeter-greeter and mascot of our farm, and will be forever missed. Truly the King of Cats. Charlotte was the last surviving hen from our first batch of chickens, obtained from a hatchery in July 2009. She shuffled off this mortal coil in February 2015 at the age of 5-1/2. She was an excellent shoulder chicken and a sort of unofficial mascot for our local OSPCA, where she made appearances at the annual "Pet Pics with Santa" event and never once pooped on Santa's lap. In the last summer of her life, she became broody for the first time ever and hatched out three beautiful chicks from some eggs of dubious parentage. When Charlotte turned 5, we threw a birthday party for her, which you can read about here. Her babies live on at Bee Meadow Farm. This sweetheart of a cat loved to stick her tongue out and drool when you pet her. Millicent was abandoned at a nearby farm when her elderly owner was sent to a nursing home. Sometime after that, another neighbour noticed a starving cat at the empty property and began feeding her. Over the next three months, this woman (a senior citizen herself) fattened Millicent up nicely, but she couldn't offer her a home, so she asked a mutual friend of ours if Gordon and I would take Millicent as a barn cat. She kindly offered to pay for her spay surgery as well. So now Millicent moved in. She was very shy but she was also very affectionate, and loved to be cuddled. After a few months, she began to come out of her shell and blossom, but when humans have left you to starve, it takes a while to trust them again. We couldn't have been happier having Millicent with us. She was born sometime in 2015 and that mark on her forehead is a patch of grey, not dirt. We adopted Millicent on September 9, 2016. In 2017, she was diagnosed with an inoperable malignant abdominal tumour, and on September 24, 2017, we had her put to sleep. She was only three years old and was cruelly taken from us to soon. We will never forget this special little cat.